Distillation is a technique by which two or more substances with different boiling points can be separated from each other. For example, fresh water can be obtained from seawater (water that contains salts) by distillation. When seawater is heated, water turns into a vapor that can be condensed and captured. The salts in the seawater remain behind. In contrast to the preceding example, distillation is most commonly used to separate two or more liquids from each other. Imagine a mixture of three liquids, A, B, and C. A has a boiling point of 86°F (30°C); B has a boiling point of 104°F (40°C); and C has a boiling point of 122°F (50°C). Ordinary gasoline is such a mixture, except that it consists of many more than three components. The three-liquid mixture described above is added to a distillation flask, such as the one in the accompanying figure of the distillation setup. The mixture in the flask is heated by a Bunsen burner or some other apparatus. The temperature of the liquid mixture rises until it reaches the boiling point of any one liquid in the flask. In our example, that liquid is A, which boils at 86°F. Liquid A begins to boil when the temperature in the flask reaches 86°F. It turns into a vapor at that temperature, rises in the distilling flask, and passes out of the flask arm into the condenser. The condenser consists of a long tube surrounded by a larger tube. The outer tube contains water, which enters near the bottom of the condenser and leaves near the top. The water passing through the outer jacket of the condenser cools the vapor passing through the inner tube. The vapor loses heat and condenses (meaning it changes back to a liquid). It flows out of the condenser and into a receiving container—a flask or beaker placed in position to capture the liquid. The liquid (liquid A) is now known as the distillate, or the product of the distillation. Meanwhile, the temperature in the distilling flask has not changed, as indicated by the thermometer in the mouth of the flask. Heat added to the liquid mixture is used to vaporize liquid A, not to raise the temperature of the mixture. That temperature will begin to rise only when liquid A has completely boiled away. By watching the thermometer, therefore, an observer can know when liquid A has been completely removed from the liquid mixture. At that point, the receiver containing pure liquid A can be removed and replaced by a new receiver. Once liquid A has boiled away, the temperature in the distilling flask begins to rise again. When it reaches 104°F, liquid B begins to boil away, and the sequence of events observed with liquid A is repeated. Eventually, pure samples of A, B, and C can be collected. their boiling points. Vacuum distillation is used for such liquids. 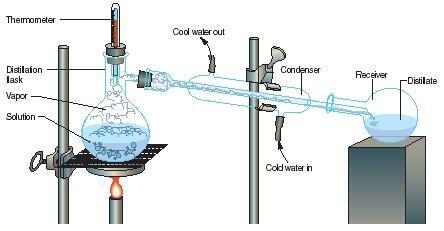 In vacuum distillation, air is pumped out of the distilling flask. Under reduced pressure in the flask, liquids boil away at temperatures less than their boiling points (below the point at which they would otherwise decompose). Distillation is among the most important and widely used industrial operations today. About 95 percent of all separation processes today are carried out in industry with more than 40,000 distillation systems. Those systems generally consist of structures that look very different from the one shown in the distillation setup figure. For example, a petroleum refining plant is usually distinguished by a group of distilling towers that rise more than 100 feet (30 meters) into the air. The principle on which such towers operate, though, is no different from the one described above. In petroleum refineries, crude oil is heated at the bottom of the refining tower. The hundreds of compounds that make up crude oil each boil off at their own characteristic boiling point. They rise in the refining tower, are cooled, and condense to liquids. Collectors at various heights in the tower are used to draw off those liquids into various fractions known by designations such as gasoline, diesel oil, heating oil, and lubricating oil. A similar process is used in many other chemical processes. It is common that many by-products are produced along with some desired product in a chemical reaction. The desired product can be separated from the by-products by means of distillation. Wow! This page is really helpful... I have a science test tomorrow and this is just the right topic, it's a great explanation. Yes, I agree! I'm doing this practical 2moro and it really does help! Thanx so much! This page was very informative, thank you for writing it. I was looking for a bit more detailed information on vacuum distilation, but it did clear up a lot about heat distillation, and briefly scrape vacuum. It did help a lot. what are the NOT factors in determining the state of a substance.